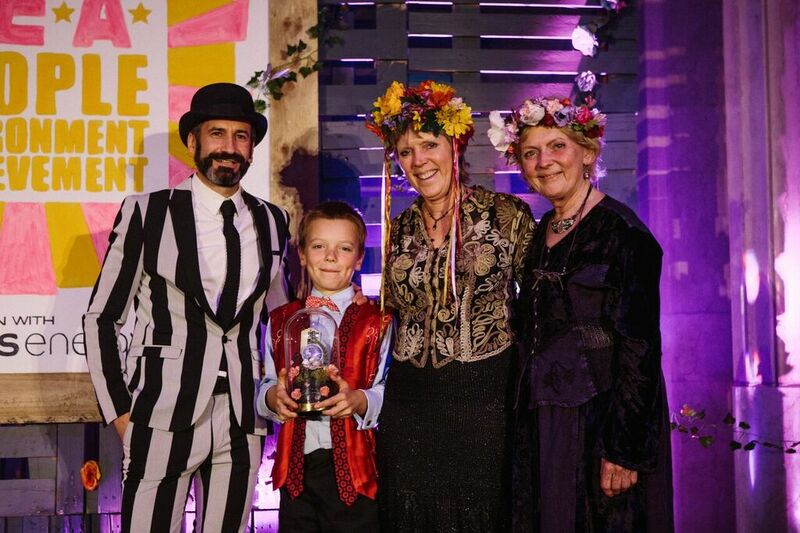 Horsham families are at the forefront of the fight against climate change and have been recognised with a National Award. Carrie Cort, her 9 year old son Adam and her Mother, Jean Francis went to collect the award for their family’s efforts at the P.E.A. Awards in London on Friday 13 October. These awards acknowledge green heroes from the UK and beyond. The night honoured those who are dedicating their lives to ending the forces that are driving extinction – from deforestation abroad to over-consumption right here in the UK. The Awards recognise people who are taking matters into their own hands and providing inspiring alternatives to business as usual. They recognise people who are pioneering sustainable initiatives in the UK and beyond. Carrie, her family and lots of Horsham volunteers run an environmental awareness and education initiative called Sussex Green Living. It is an ever growing group of people, many parents with children who are helping the community to move towards a more sustainable future. These volunteers also run the new Horsham Repair Cafe, their greening efforts in Horsham continue with unstoppable momentum. Jean Francis, Carrie’s Mother is one of the volunteers. Jean adds “I remember ration books and gas masks, re-pairing and re-making therefore living green comes naturally. I am one of the clothing repairers at the Horsham Repair Cafe”. Jean Francis is also a OneSpirit Interfaith minister, she helps people create personal ceremonies and most importantly make environmentally friendly choices. Following in his Mother’s footsteps is Adam 9 years old and claiming his second National Award of the year. In March he was won the Key Stage 2 poster category of WWF’s Earth Hour ‘The Future We Want’ competition. His winning entry entitled the Climate Cartoon, depicted different images of environmental problems, from rainforest destruction to forest fires with sustainable solutions alongside each. Claire is tackling the problem of single-use plastics from both sides: reduce and reuse. A savvy social networker, Claire leads Beach Cleans to recover ‘waste’ materials, which are transformed into physical products in her studio. Claire also founded the Plastic Free Pledge, encouraging people and businesses to commit to ditching single-use plastics. Unlike any other cement-based system, Envirup’s external wall insulation can be fitted in any weather conditions. The insulation shell – made from 75% recycled PVC – is suitable for the most difficult to treat ‘non-brick built homes’, so it could save the most vulnerable residents £180-445 per year and help put an end to fuel poverty. This UK tech startup designs and builds light-emitting devices that retrofit to fishing gear and attract and repel different species, based on their behavioural response. The goal is to make the fishing supply chain more sustainable by helping crews catch only the right fish. During trials last year, bycatch was lowered by up to 60% in a North Sea fishery. MacRebur has found a pioneering use for waste plastics: its product goes into roads, acting as a binder and replacing some of the oil-based bitumen. This creates road surfaces that have proved (in independent tests) stronger than the current asphalt mix. The product has lots more potential uses. In Piplantri, a village in Rajasthan, India, 111 trees are planted each time a girl’s born in the community, with over 250,000 trees planted to date. Each girl’s financial security is ensured through contributions, and her education isn’t cut short. This year, Huw Davies and his team at Triodos Bank UK were instrumental in the launch of the Triodos Personal Current Account – the most sustainable personal current account ever brought to the UK market. Triodos only lends money to organisations and projects that are making a positive difference to society, be it socially, culturally or environmentally. Cork fashion products and accessories have the same benefits as their leather or pleather counterparts – and not a single cork oak tree’s harmed during the cork harvest. KorkAllee.de (CorkAlley.com) is Germany’s first online shop to sell a range of exclusive, premium quality cork products. VeggieHotels is the world’s first hotel directory for purely vegetarian and vegan hotels, B&B lodgings, seminars and health centres. From about 100 locations at launch (Sept 2011), the portal has now grown to include over 500 venues, catering for travellers looking for a city break, a holiday in a monastery, a hiking or beach holiday and more. Green Oil UK was born in a garden shed from a single green chain lube, old machinery and a vision. Simon has since developed a whole eco-friendly bicycle maintenance range: technically formulated for performance, Green Oil products remain biodegradable after use and safe for your hands. This in a world where petrochemicals and PTFE pollution are rife from bicycles. Louise launched Vegan Festival UK back in 2014 while studying for a business degree. As a longtime vegan she wanted to spread the vegan word and share her knowledge on the subject, so she launched a vegan festival in her hometown of Newcastle. Vegan Festival UK now runs events from Aberdeen to Sheffield, and each attracts several thousand people. Carrie ends by saying “We need to be making sustainable changes to our lives as fast as we can and completely as we can, but we also all need to be taking as many people on the journey with us. We must inform, motivate and inspire everyone into change for the good of the planet and all who live on it”. For more information about action you can take to help the environment visit www.SussexGreenLiving.co.uk, www.HorshamRepairCafe.org.uk and www.circleoflifecelebrations.co.uk. 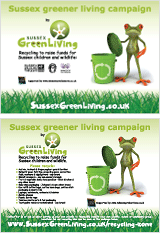 Or visit http://www.sussexgreenliving.co.uk/parents-zone/green-home/#2 to see 22 actions against Climate Change. Photos From The Night – you can download photos from the P.E.A. awards night here. Now in its seventh year, the P.E.A. (People. Environment. Achievement) Awards, in association with Octopus Energy, celebrates the green heroes who are taking matters into their own hands and providing inspiring alternatives to business as usual. For more information and a gallery of images from the night, visit www.peaawards.com. Carrie had won numerous awards for her environmental work, more information can be seen here. Adam earlier in 2017 won the WWF Climate Challenge KS2 award with his Climate Cartoon, read about this competition and his visit to the Palace of Westminster here. This entry was posted in Climate change, Events, Green stats, facts & news. Bookmark the permalink.